The Department of Visual Arts at Minnesota State Community and Technical College Fergus Falls and the Kaddatz Galleries are excited to announce the First Annual Visiting Artists Workshop series. The purpose of this workshop series is to give participants from the region the opportunity to learn from and create with arts educators and professional artists from around the nation. Both the Department of Visual Arts at Minnesota State Community and Technical College Fergus Falls and the Kaddatz Galleries strive to provide experiences and opportunities that aim to change who we are at our core, the way we see our environments and promote personal educational inquiry. Our similar institutional values brought our organizations together to co-host this annual workshop series. Our combined mission for this endeavor is to provide regional artists with access to professional, and teaching artists’ knowledge and experiences and provide unique, high-quality educational opportunities that are highly accessible to people in our region from all backgrounds. Our First Annual Visiting Artists Workshop series will be an exploration of printmaking where participants will learn and engage in screen printing demonstrations, artist talks, discussions on the significance and legacy of printmaking, and the conception and creation of a collaborative artwork which will be shown throughout the region. This year’s visiting artists are Joshua Butler, a professional studio artist, printmaker, and professor at Colorado Mesa University, Matthew Hanson-Weller, a professional studio artist and printmaker from Durango, Colorado, Cody Spiegel, a professional studio artist, printmaker, and sculptor from Port Townsend, Washington and Howard Paine, a professional studio artist, printmaker, and professor at the University of Nebraska – Omaha. 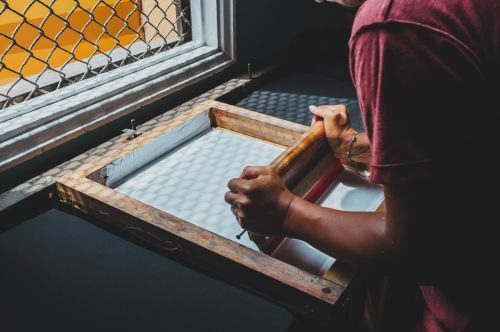 The first session of the two-day printmaking workshop will be Friday, February 22, 2019, from 9 a.m.-4 p.m.at the Kaddatz Galleries in Fergus Falls. The second day of the workshop will be Saturday, February 23, 2019, from 9 a.m.-4 p.m. in the Department of Visual Arts at Minnesota State Community and Technical College in Fergus Falls. This workshop is FREE and open to anyone aged 14 years and older, but space is limited to 25 total participants so we suggest you register early to ensure that you can take part in this fantastic opportunity. Previous screen-printing experience is not required for you to participate in the workshop. John Charles Cox is an Instructor of Visual Arts at Minnesota State Community and Technical College. This activity is made possible by the voters of Minnesota through grants from the Lake Region Arts Council, thanks to a legislative appropriation from the Arts and Cultural Heritage fund. Minnesota State Community and Technical College, a member of the Minnesota State system, is an affirmative action, equal opportunity educator and employer. Friday, February 22, 9 a.m.-4 p.m.
Saturday, February 23, 9 a.m.-4 p.m.
Department of Visual Arts at Minnesota State Community and Technical College in Fergus Falls.